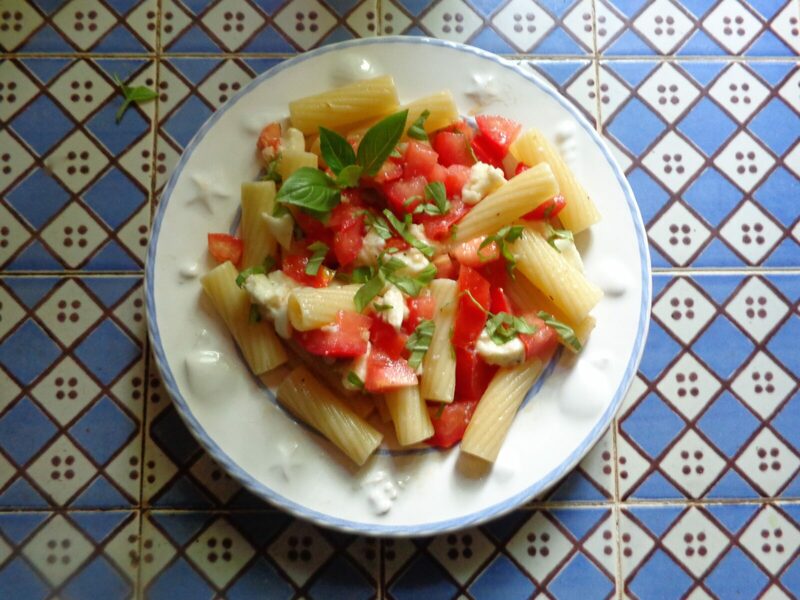 In this unusual pasta recipe, the tomatoes are uncooked – simply chopped and combined with mozzarella, basil, garlic and olive oil for a summer meal that is simple to prepare and, more importantly in hot weather, served lukewarm. It is a version of a recipe I first encountered in Sicily in a slightly different form: with the dried sheep’s cheese ricotta salata instead of mozzarella. Which pasta to choose? It really doesn’t matter. Spaghetti is great, as are the various tubular pastas, such as tortiglioni (shown in the photo). Just follow the instructions on the packet to cook the pasta al dente just before serving. Rinse the tomatoes and chop into small cubes. Place the cubes in a large bowl. Drain the mozzarella, slice in half and chop into cubes. Add to the bowl. Mince the garlic and add. Pour in the olive oil. Season to taste with salt and pepper. Snip most of the basil leaves finely, retaining a few whole leaves for garnish. Sprinkle half the snipped leaves into the bowl and stir. Bring a large pot of salted water to a boil. Add the pasta and cook al dente. Drain the pasta and pour it into the bowl while still hot. Ladle into shallow soup bowls. Sprinkle the rest of the basil over the top, and garnish with a couple of whole leaves. Serve while still warm. Serves 2. If you can find ricotta salata – not easy in Paris, although the eminent Parisian food blogger David Lebovitz recently mentioned it in a column on wild garlic – by all means use it instead of the mozzarella. It is a dry form of ricotta that is quite salty, as its name implies. Instead of adding it to the tomatoes, grate it as though it was parmesan and sprinkle on top of the warm pasta. The California contingent loves this recipe! Thanks for pointing out that one should be generous with the salt if using mozzarella – it makes a big difference! We had it alongside a salad full of local avocados & radishes, followed by blueberries & raspberries & blood oranges. Perfect. Good to hear from you, Mlle Taupe (aka Miss Mole). Very happy to hear that my recipe made it to California, and your salad and dessert sound fab!